I have three sisters. My house was usually overflowing with girlish giggles, chit chat about hair, shoes and even sensitive topics that would make any man writhe in his seat. Our girlfriends would often come to visit, adding to the weight on the feminine side of the scale in our home. But my father, although often quiet and reserved, didn’t fade into the shadows. His example and support shaped each one of our lives. From the honest integrity with which he ran his business, to his passion for cars, he provided an independent, brave example that was unwilling to compromise on ethics to get ahead. Some of my fondest memories are the exciting swap meets I enjoyed with him as a child, and watching him restore regal, but dated cars to their original glory in our garage on weekends. I grew to love all the smells of oil and polish, grease, and metal. I loved when he would take me with him on an errand, like a trip to a special parts supplier far away, or to job sites for his business. In Highschool I wound up the only girl in car care class, where I learned how to change the oil and brakes on my ’87 Monte Carlo. I was proud to hear its small block 305 engine rumbling as I drove it into the high school shop. My Dad’s influence is clear in many of my own passions and aspirations. He taught me about how to handle turns on a race track and I think of him everytime I take curves on the parkways (even in my minivan). But more than love of cars, hard work and getting dirty, he provided numerous other examples and a special kind of support. My Dad never pushed me to go in any particular direction. Instead he listened, and payed attention to what mattered to me. What I was passionate about. What made me happy. Then, with his quiet demeanor he stepped in to make it happen. He never announced his favors, or reminded me about them. They were always just there. Just right. Like many fathers, my Dad worked hard (and still does!) for his family. Successfully running his own business, the stress of which I recognize more keenly now. Even with the ups and downs and uncertainty of that difficult endeavor, we were his primary concern, before himself. He invested so much in my family – in me. I’m sure when I announced my decision, that I had become Muslim, it couldn’t have been easy for him. But he put my happiness first. He affirmed that I could believe whatever I wanted to. 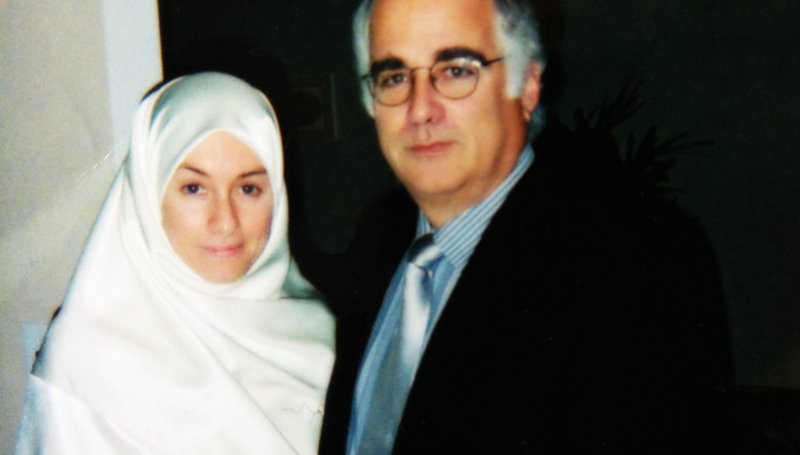 The stage following my decision to enter Islam was tough for me and my family at times. When I moved back to my parent’s house after a year or so developing as a Muslim away from home, there was inevitably some tension. I knew my mom felt uncomfortable about me covering my head. It must have been hard, seeing her daughter looking so unlike the girl she had raised. I was torn between not hurting my mom and wearing a piece of cloth – an identity that had become beloved to me. So, When I would go off to work in the morning, I’d wear the hood on my jacket from the house to the car. Once in my car I would awkwardly struggle to fix my hijab in the rearview mirror. Upon returning home, I would remove my scarf and replace it with my hood once again. I thought no one knew. But, my Dad was so aware. He always seemed to somehow know what was going on. One day he approached me and informed me, he had seen what I had been doing. “You don’t have to do that.” He gently told me. He assured me I didn’t have to hide my hijab. I saw the compassion in his eyes. Though all my family has gradually become somewhat more comfortable with my Muslim identity and my choice to cover more of my body, my Dad has perhaps shown the most support. Warning me when a Man is coming over or at the door and making sure I am dressed before he allows them in. He held my hand at my marriage. kneeling on the floor in a mosque, he facilitated yet another happiness for me. That is real love. The kind of love to ponder – that boggles the mind and fills the heart. I pray I will grow to be a better daughter, to express that same kind of love to my father. To give back a little, even a fraction of what he’s provided me. To make him know that he’s my hero. It’s always awkward for me when holidays like Father’s Day roll around. A special day to celebrate our fathers and let them know how much we care? Sheesh! In Islam, we’re supposed to do that every day! But… I don’t. Not adequately at least. In fact, by the standard of Islam, I should be doing a lot more for both my parents. So, when Father’s Day comes, it’s like an elephant in the room for me. I want to avoid making something of it because we just don’t participate in extra ritualized “holy” days. At the same time, that huge elephant is crowding my space, reminding me that I don’t show my appreciation for my Dad enough. I suddenly feel so small, so pathetic – and I want to call, but at the same time I want to ignore it. I should have called yesterday, or the day before! So I put it off and put it off, rehearsing my words each time, until, it becomes late in the evening. I’ll call tomorrow. Rationalizing my hesitation to myself. So here I am, a day late, or 364 days early depending how you look at it. If nothing else, Father’s day and Mother’s day serve to show me the glaring deficiency in my treatment of my parents. The fact that I know they will feel neglected by me that day only highlights the neglect on every other day, because in fact, every day should serve to honor them, and every day they should feel my love, my appreciation for them – whether by presence, words, actions, or some small token. These holidays are probably like elephants in the room for my family as well; my absence must be painfully obvious. A heightened awareness of my silence or apparent lack of appreciation may linger in the backs of their minds, unspoken, all day. The only way to overcome this would be: to be the kind of daughter I should be, the kind God has instructed me to be, on a daily, or at least regular basis, such that when holidays roll around, my family will still know how much they are loved and appreciated – whether I’m there to party with them or not. Even if I happen not to call that day.